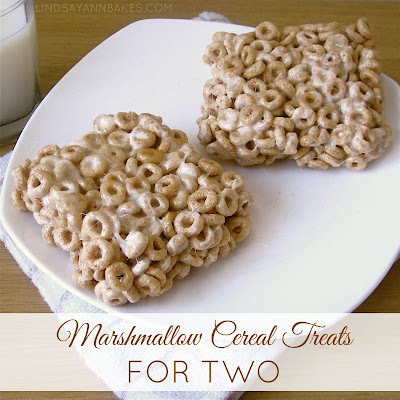 This twist on the classic rice krispy treat is a really fun way to enjoy your favorite breakfast cereal in a no-bake, marshmallowy, crunchy cereal treat for two! You can really use ay type of cereal you like, but my favorites are Cinnamon Toast Crunch, Reese's Puffs and todays version, using Honey Nut Cheerios. The best part about these is that they are so easy to whip up with no baking required. There is no egg or dairy and they can easily be made gluten-free by using GF cereal. They make a perfect lunch box addition, morning grab-and-go breakfast or, cut them up into smaller pieces, for a tiny snack, anytime! They are really easy to make. Just like a traditional marshmallow cereal treat, you melt the butter and marshmallows. Turn off heat, add cereal and stir. Pour into prepared pan. Press mixture flat and let cool. 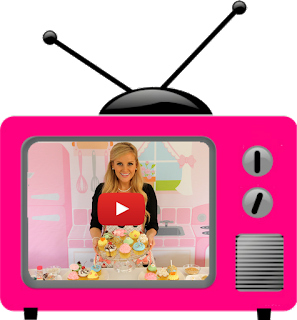 Line a small, 8"x4", loaf pan with wax paper or and thoroughly butter or spray with non-stick cooking spray or grease 4 wells of a cupcake/muffin pan. In a small saucepan, melt 1 tablespoon of butter over low heat. Add marshmallows and stir over low heat until completely melted. Turn off heat and add cereal, stirring until well coated. Pour into prepared pan. Using buttered spatula or spoon press mixture flat and let cool slightly. Cut, serve and enjoy!